In this inbetweenisode, I share the power of checklists! Checklists are often overlooked due to their simplicity. 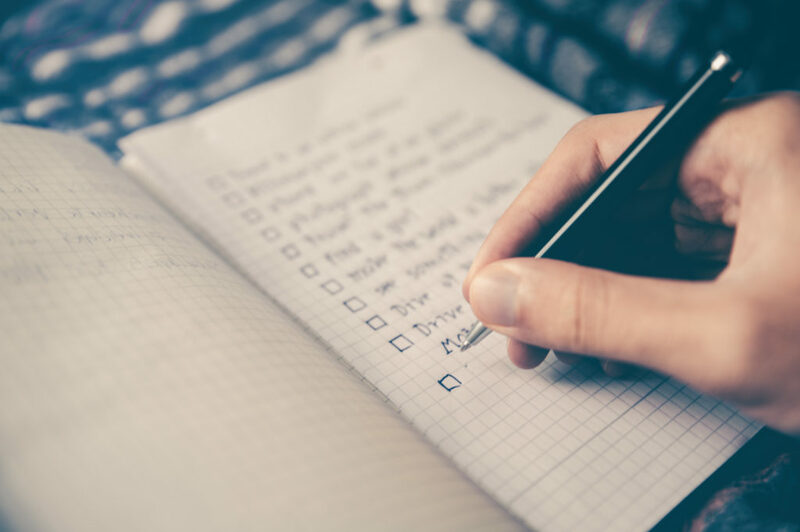 However, with today’s information overwhelm, it’s never been a better time to create checklists for all of those repetitive tasks. This removes the need to remember all of the to-dos within a project and increases accuracy and effectiveness. In this podcast, I forgot to mention how my buddy, Tom Church, first inspired me to use checklists. You can listen to my interview with Life Hacker and Latestdeals.co.uk co-founder, Tom Church, here. Why checklists are super handy! I send this to my sound engineer and continuously refine and improve. If you notice a serious error in the podcast audio during your work, please notify me immediately. Add post title – include the guest name and attention-grabbing headline such as “How to do X” or a profound claim of some kind. Please use hyper-specific niche topics discussed on the podcast. For example, for interview #46 rather then use The Keys to Running a Successful Business, you could use the importance of creating a customer avatar. These headlines may help the episode stand out from the rest. Please shorten the default permalink. Set a headshot as a Featured Image and best/most interesting image you can find (I may provide) and add to top of post body above bio. Just to clarify, that means 2 images. One image in the Featured Image and one image at the top of the post body. Mini biography and contact details for guest (I will send you this). When adding email don’t hyperlink it, just list the email address and put a [ ] around the @ like [@]. This stops bots from spamming emails. High-level bullet points of what is covered in the episode. Libsyn player with correct links below. Also please add keywords to Libsyn post such as guest name and main topics mentioned (please check iTunes style rating). Selected links (even the most tenuous) from Episode in chronological order (every person, place, book, entity, or product including food that is mentioned that has a web presence, use US and UK Amazon affiliate links for books/products). Please make sure ALL links ‘open in new tab’. Please add relevant keywords to Word press post tags. Please add a Description under All in One SEO Pack. Please add to all relevant categories. I send this to a contractor on UpWork. Let me know how you think I can improve these checklists! It’s great for those recurring habits you do day to do that are important to your outcomes. I use it, and urge my clients to as well. Wide range of application, and built in adherence tracking. Thanks Blair. Downloaded and experimenting ??? ?.